When you research your fantasy football league and find out how many roster spots you have, you can turn your attention to preparing for your draft based on those requirements. 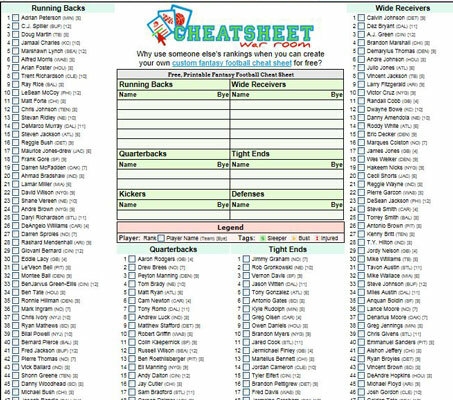 You can print out your own roster cheat sheet from CheatSheet War Room. Besides the roster sheet, you can find other free printable fantasy football cheat sheets, specific to this year’s players. Some leagues offer a position called Flex instead of a third wide receiver slot. The flex position can be filled with a running back, wide receiver, or tight end. The major positions on your fantasy roster are the same as the major positions on offense in football. RBs take center stage in fantasy football, not QBs. WRs are the unsung heroes of fantasy football because they can score plenty of fantasy points, but they’re often overshadowed by RBs and QBs. Only a few TEs are major parts of their teams’ offensive gameplans; thus, a TE’s impact on your fantasy team is often limited. As for the Ks, most of them get the job done, so you only need to draft one. The last position in your starting lineup isn’t based on individual stats but on the stats of everyone on an NFL team’s DEF. You select an NFL’s defense to start each week, and you score fantasy points based on everything from TDs to sacks. Sometimes, special teams’ plays (return TDs and yardage) also count for your defensive unit; in these leagues, the DEF will be called D/ST. More advanced leagues use individual defensive player (IDP) positions; in these types of leagues, you draft individual defensive players rather than the team DEF. If you’re a fantasy football novice, focus on the offensive players and a team DEF for now and consider joining an IDP league in the future. In addition to the starting lineup, each team also has backup players sitting on the “bench.” The size of your bench depends on the type of league you’re in and on how many starters you have. Most benches range from five to ten players. Every NFL team has one week of the season off (the bye week), all players face some tough matchups, and injuries are sure to rear their ugly head, so your bench will play a huge role in deciding your fantasy fate. Most leagues have roster rules that teams must follow during the draft. For example, you can’t draft only RBs and leave your roster without a TE. The common requirements state that each team must have a complete starting lineup based on league settings, but your bench players can play any position. Some leagues also set bench requirements. Usually, you can carry as many position players as you choose, but some leagues have restrictions to prevent collusion and unfair play. For example, some leagues may limit you to two QBs, two TEs, and two DEFs, with no limit on WRs and RBs.